Whether in production, or repair and rework, the cost of soldering iron tips can be easily overlooked, but with today’s requirement for higher temperatures in lead-free solder applications, the consumption of tips has dramatically increased. This fact, combined with changes in tip design to meet the higher thermal load requirements, has also resulted in escalating tip costs, making tip care a high priority. The requirement for soldering irons to provide higher thermal performance. Shorter tip life due to the increased temperature/thermal load. Faster oxidation of tips due to the increased temperature. When not using the soldering iron, turn the power off. Accessories such as “sleep work stands” or “power down” functions will certainly help tip life but turning the power supply off when not in use will help even more. If using a sponge, do not oversoak it. Remember that every time the tip touches the sponge, a thermal shock occurs, potentially damaging the plating (e.g., if cold water is applied to hot glass, cracks occur). Do not use pliers to remove the tip. Undue pressure can easily deform tips. Use the tip removal pad. Make sure the tip is tinned with solder at all times. Solder helps protect the iron plating and prevent oxidization. A burnt or blackened tip will not take solder. Clean tip with brass curls. Replace the hand piece in the work stand. Note: It is recommended to turn the power supply off before cleaning the tip for storage. This will reduce the oxidation while performing maintenance of the tip with brass curls. Select right size tip geometry for the joints being soldered. Ideally, it should be the largest possible size necessary to accomplish a good solder joint. Do not apply too much force on the tip during soldering. Use brass curls to clean the tip because this is better than a water-soaked sponge. Use a soft brass brush for tough oxidation buildup or whenever brass curls may have difficulty in removing the oxidation from the tip surface. Use tip tinner. Thermaltronics tips have more plating on the working end of the tip and this extra plating allows operators to use tip tinner/cleaner (TMT-TC-2) to restore tip life. Note: When iron plating is exposed to water and oxygen, it corrodes. Oxidation is a chemical process that is caused by the interaction between oxygen and other elements that come from all kinds of fluxes, water, etc. Turn off the power supply. Dip the tip in the tip tinner/cleaner. Re-tin the tip and return to the stand. Note: Most soldering tips operate at 375˚C+ and since the typical lead-free solder wire melt temperature is ±217˚C, there is still sufficient thermal energy left in the tip to complete the above process. If power is left on during the cleaning process, the power supply will drive more thermal energy to the tip and try to heat the tip tinner or wire brush. Use brass curls to clean off the oxide. 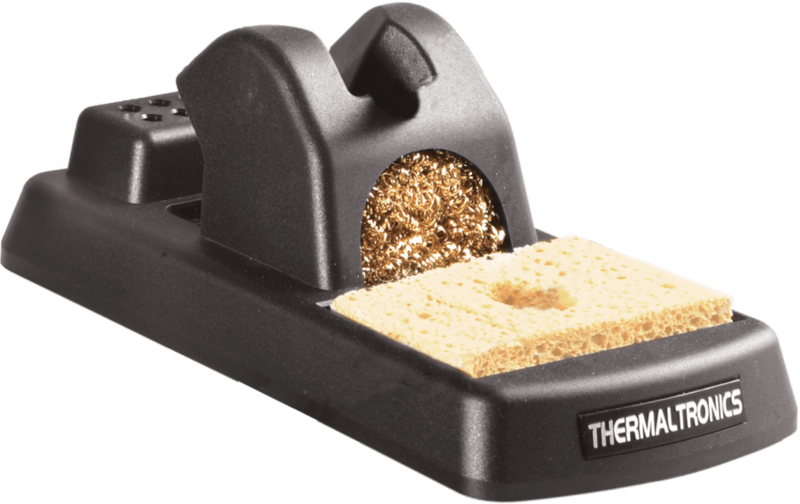 Make sure the sponge is Sulphur-free and designed for soldering use. Do not oversoak the sponge: squeeze it to release excess water. Use deionized water – not tap water. Do not repeatedly use the sponge – water is H2O and the oxygen part will add to potential oxidization. Once clean, tin tip and return to the stand. If the above procedures are followed, tip life can be maximized.